The IE University presents the First event of the IEU Entrepreneurship Evening Series of the academic year! 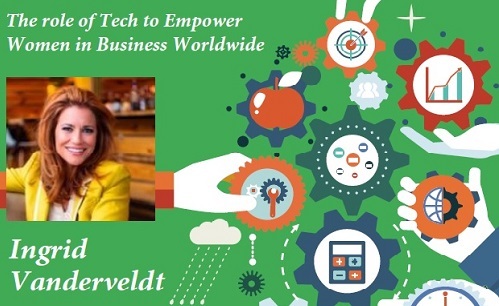 This time a great speaker, Ingrid Vanderveldt, will talk about The Role of Tech to Empower Women in Business Worldwide. Ingrid currently sits on the 2nd United Nations Foundation’s Global Entrepreneurs Council, is founding organizer of the GLASS Forum (Global Leadership & Sustainable Success), and co-founder of The Billionaire Girls Club. 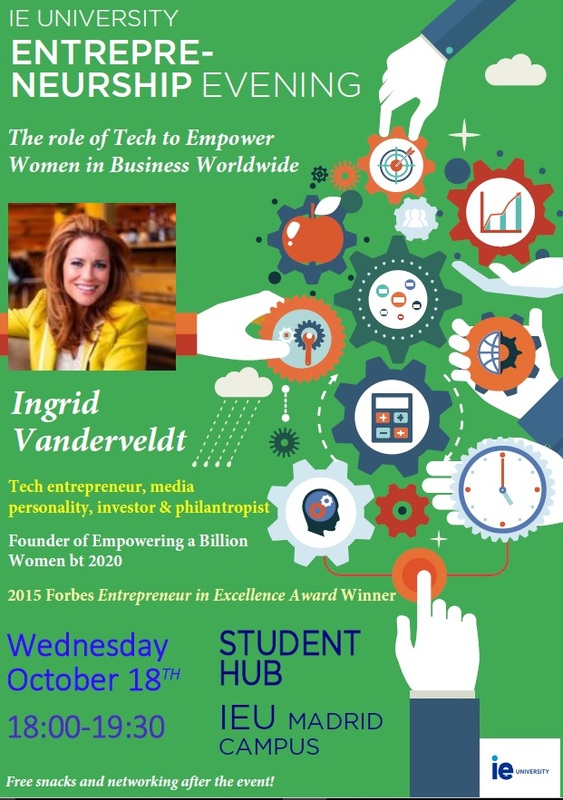 Ingrid Vanderveldt is a tech entrepreneur, media personality, investor and philanthropist. She is the Founder and Chairman of Empowering a Billion Women by 2020 (EBW2020), MintHER™ and Vanderveldt Global Investments. She was the first Entrepreneur-in-Residence (“EIR”) for Dell Inc. and created and hosted CNBC’s first original primetime series, “American Made,”. Her mission today with the EBW2020 initiative is to encourage women to achieve successful careers in the world by providing them with tools, technology and resources. She has earned the “Entrepreneur in Excellence Award” granted by Forbes in 2015 and has been considered one of the 55 most influential women in the world on Twitter.